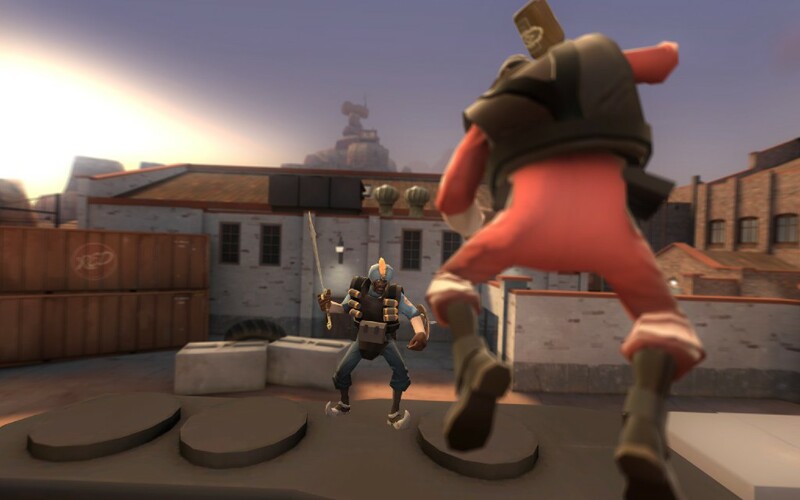 If you’ve visited SPUF, you’ve probably heard the poor demoknight trashed as the weakest possible way to play a TF2 class, that he’s a mediocre midrange picker bested by anyone in any situation, that Valve for some reason continues buffing and releasing unlocks for him despite nobody considering him a valid class. Those people have a lot of clout and their stance is not unreasonable. You’ve also probably heard SPUF proclaim the demoman as one of (if not the) most powerful and versatile class in TF2, capable of doling out hundreds of DPS, setting lethal traps, rapidly switching from offense to defense, and in general being a golden class that is rightly limited to one per team in any competitive setting. Again, this stance is not unreasonable. So, when SPUF user “The Pyro King” announced (and later flaked on, forcing myself and thesupremecmdr to pick up his slack) the Demoman Vs. Demoknights fight, everybody on SPUF was quick to predict the event would be an incredibly easy win in favor of the team composed entirely of explosive weapons and bottles. The demoman team filled up almost immediately (including myself initially), and the demoknights became anyone who showed up late and didn’t mind getting curb-stomped if it meant getting to be a part of the event. Anyone who wasn’t in the event loudly questioned why such a one-sided event need bother occur, and there was a large movement demanding that demoknights be allowed to use grenade launchers to give them a fighting chance. But I stuck to The Pyro King’s original wishes (wherever he disappeared to) and when the first round started (best out of three on badwater), demoknights were restricted to booties, shield, sword/axe. The end result of Badwater? The demoknights won. Handily. Offense and defense. When round two started (Yukon) the demomen refused to keep playing and the event fizzled out. But it was quite interesting to me why that had happened. (Of course, everyone on SPUF started posting that they knew this was going to happen, and X reason was totally unfair in favor of the demoknights, blah blah blah.) I’d like to spend this post detailing the main reasons why I think the most powerful class in TF2 lost to the least powerful subclass. Reason 1: The demomen have a severe weakness at close-range. – The sticky launcher is a powerful midrange weapon capable of shredding opponents who haven’t reached you yet, and the grenade launcher complements this while adding the ability to easily damage mid-long range with decent aim. That leaves the reliable but ineffective bottle for melee (we didn’t allow cabers for either team.) 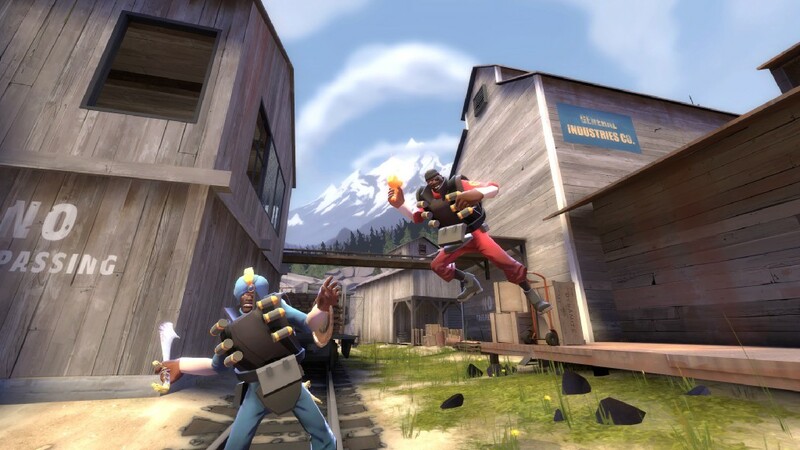 If the demoknights could reach the demoman, he had an excellent shot at beheading him; good thing his shields absorb explosive damage and allows him to traverse the distance in seconds! Reason 2: The demomen’s other severe weakness is a reliance on setup time and reloading – For the first five seconds of the match, everything went as planned. Demoknights left spawn and were gibbed by 8-bomb sticky traps. It was a massacre. However, the next time they respawned, there weren’t quite as many stickies reset on the ground…despite there being 9 of them, the very slow reload speed of the demomen’s weapons left them unable to reliably hold ground, so slowly but surely the demoknights pushed their cart through enemy territory, using it to heal and clearing the upcoming terrain through isolated picks. When the demomen were on offense, they couldn’t lay down enough suppressing fire fast enough to prevent the demoknights from assaulting them every time they ventured mere feet from spawn. The cart never reached the first checkpoint. Reason 3 The demoman’s other other severe weakness is a huge amount of self-damage and no easy ways to heal. Demoman can fling a lot of explosives around. All of them are capable of hurting him as much as his enemy. With their shields, demoknights were rocking a 25-40% resistance to explosives, and had a sword which let them pick up otherwise useless ammo as health (and another sword I covered in a different blog post). A decent portion of demoman deaths involved him shooting a demoknight right in his face, taking bad self-damage, and then the demoknight finishing him off with a single swing. So there you have it. After this event, it seems that demoknights aren’t just flat out bad; they have the advantage against a lone demoman. I guess it’s kinda like how the spy in Stratego can oneshot the Admiral if he attacks first, but literally any other situation and he’s dead meat. Is this bad? No. Would I run knights vs. stickies again? Hell yeah, just as quickly as I’d run a Stratego game with teams all-spy vs. all-Admiral. That’d be badass.